As before, the dog Peanut Butter Sandwich and the cat Grape Jelly Sandwich, the anthropomorphized pets of Mr. and Mrs. Earl Sandwich of Babylon Gardens, are the main stars of this strip. But several of the supporting characters from the first two years have achieved equal status, mainly King the human transformed into a corgi; Grape’s boyfriend Maxwell; the mystics Tarot the pekinese and Sabrina the black cat; the revoltingly wealthy Milton family ferrets (particularly Keene and Rock); Sasha the b… female dog; and the supernaturals, especially Pete the griffin and the Spirit Dragon. Still in supporting character status are Zach the rabbit; the K-9 patrol of Sergeant Ralph and Kevin; Miles the wolf and his family; and the neighborhood Good Ol’ Dogs including Fox, Bino, Rex, Fido, the anime-loving Lester, and Joey. Returning plot elements include Peanut’s amateur comic strip, The Adventures of Spot the Superdog; The Pridelands book series that all the cats go gaga over; the intoxicating effects of orange soft drinks; and the Milton ferrets flaunting their riches in over-the-top displays of materialism. New plot elements include the Abandoned Manor haunted house, whether or not the domestic animals feel more naked without their collars, and several variations on the fight for Joel’s/King’s soul (whether he will return to a human or remain a corgi). New supporting characters include Res, the real author of the Pridelands books; and several supernaturals, notably three-headed Cerberus and the nine-tailed kitsune. If Book 3 of Housepets! has any flaw, it is that the reader is thrown into the strip in mid-series without any synopsis. You have to read Books 1 and 2, or all of the online strip’s Archives, to find out what’s going on. 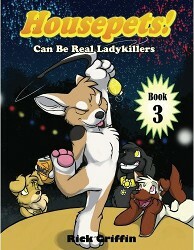 As before, this reprint book of Housepets! does not include any of the strip’s online comments. Griffin has many fans who are always complimenting him on his appealing art style, and offering additional insights into his characters and storytelling. The format of this volume is four strips of four panels per page, or more specifically four tiers per page; some of the strips are double-tiers of eight panels. New material includes fill-in art to bring a story-arc to fill a page; and a two-page “King and His Collection of Embarrassing Outfits” paper dolls. I got a super special version of number 1 where pages 22 - 1 are in reverse order. Will eventually get these. Thank you for spreading awareness of the printed versions. I wouldn't mind getting one of these books. I like the Housepets series. I've found a couple of the more recent story arcs disappointing or nonsensical (that play one especially) but they still have cute characters and, at times, great jokes. For me the worst part are the Spot strips. I usually save them so I everything but only glance through.